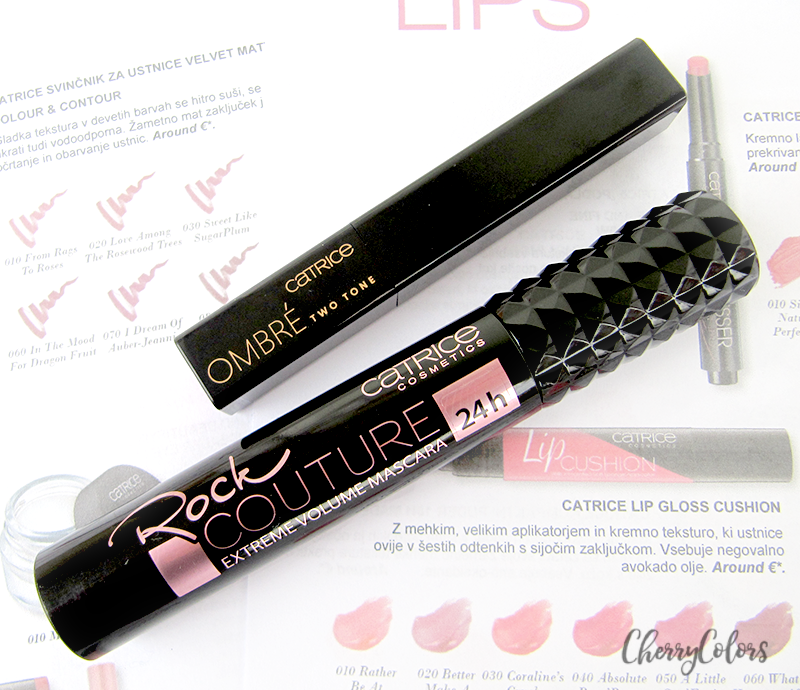 Catrice's NEW Mascara and Ombre lipstick - Cherry Colors - Cosmetics Heaven! Every half a year, Catrice and Essence comes out with new products. That's on top of their Limited Editions. It's almost that time again, the time when old products get discontinued and new ones take their place. If you don't know what I'm talking about, you can see some of the upcoming products here. 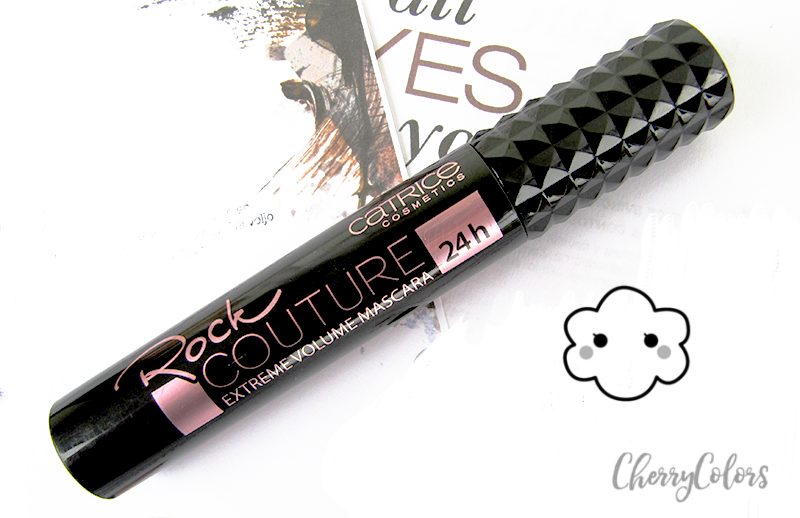 I tested two products from their new line - the Rock Couture 24H extreme volume mascara and their Ombre two tone lipstick. Okay, let's do this. I'll divide this post into two sections - one about the mascara and one about the lipstick. Read whatever spikes your interest :). I can say that the cap is very unique. I like how good it looks. It is a bit bulky but so pretty! It's very lightweight as are most mascaras and the packaging doesn't feel cheap. Rock The Catwalk. 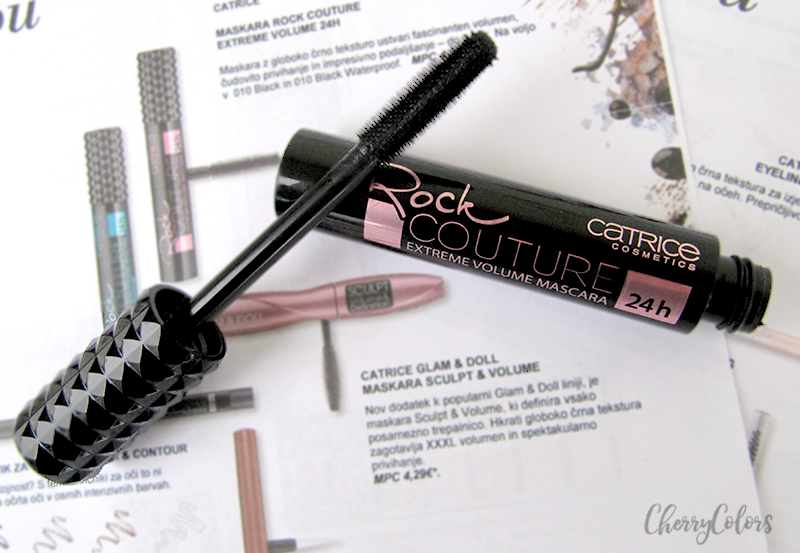 The mascara with a deep black texture and an elastomer brush not only creates fascinating volume, it also ensures a beautiful curl as well as impressive length. The instant volume effect is visible from the very first application. Long, full lashes visibly open the eyes and make them appear wide-awake. For a fresh look, shape the lashes with a lash curler and apply the mascara from root to tip with gentle zigzag movements. When applying several layers of mascara for extra volume, allow each coat to dry for a short while. This prevents the texture from clumping on the lashes. The brush is a rubber brush that has lots of tiny bristles. It looks like it could really do the trick and add some volume. If I didn't have a better mascara (it's Essence's Princess lash volume - the orange tube), I'd be all over this mascara. It gives some length to my lashes, adds a tiny bit of volume and overall looks very work appropriate. I also like that it holds the curl of the lashes. What it's lacking? Volume. Lots of it. But it may become thicker as time pass since the formula is a bit light right now. I am still willing to use it as it's a decent mascara. I must admit that I was scared to use this product. 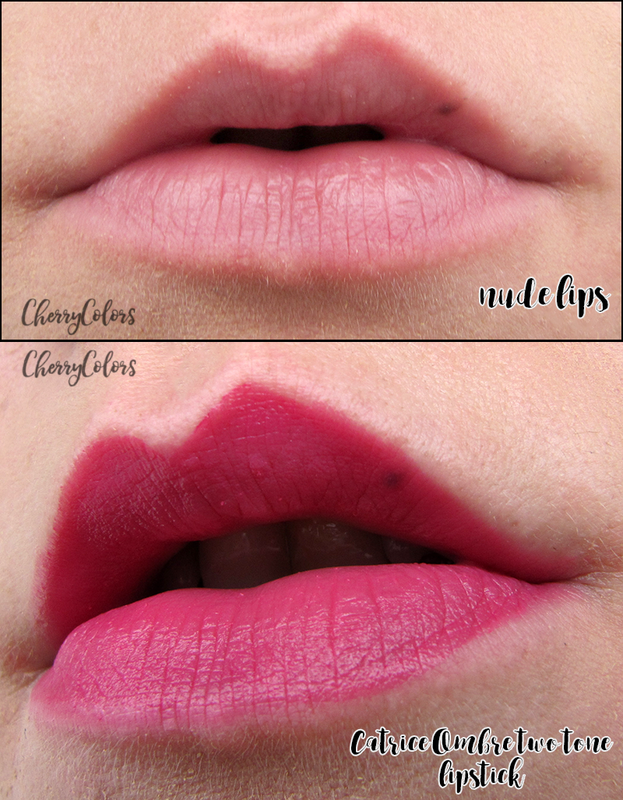 I am not a fan of the Ombre lips with a bold liner around them. They strongly remind me of 90's which I truly dislike. That's why I was a bit wary of using this. Ultimate Dimension. The creamy and soft, colour-intense texture with argan oil effortlessly brings the spectacular ombré trend to the lips. Two colours each, combined in a diamond shape, create a gorgeous finish with a colour gradient. It’s important to prep the lips for a perfect ombré look. 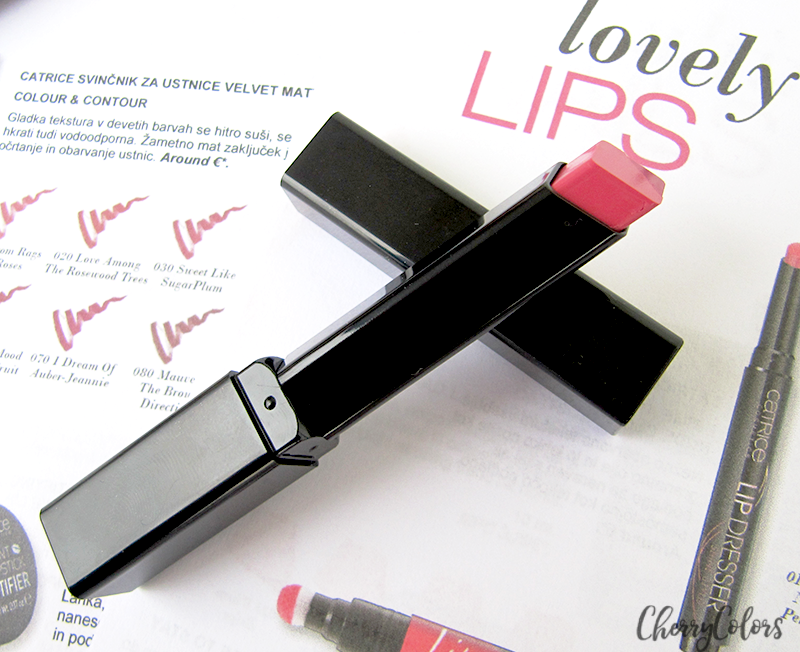 Applying a meticulous base underneath lipstick ensures particularly beautiful, smooth colour results. Once you apply the Ombré Two Tone Lipstick on the upper lip, remember to rotate it 180° to create a perfectly mirrored colour gradient on the lower lip. 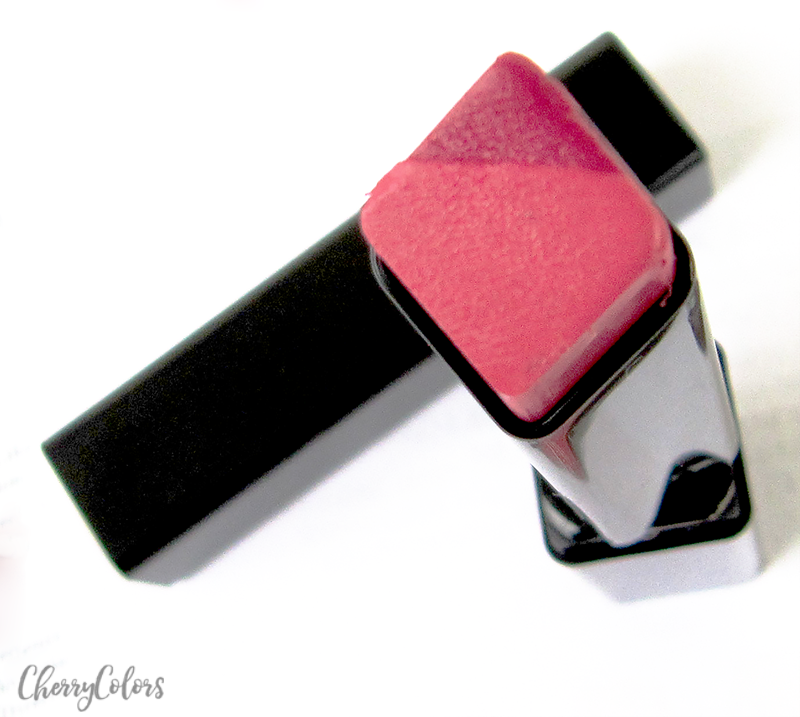 The lipstick is divided into two parts - the darker color and the lighter color. Mine is a berry pink and a rose pink combination. But once I did my swatch, I rest assured that it's not half as bad as I imagined it would be. I tried using the lipstick as advised and there was a slight ombre effect, but think my application sort of messed the look. Later I tried it again, this time paying more attention to the application and I managed to do it - the 90's look. Oh boy, that wasn't a good look on me. I was scared to use it, but the formula convinced me. 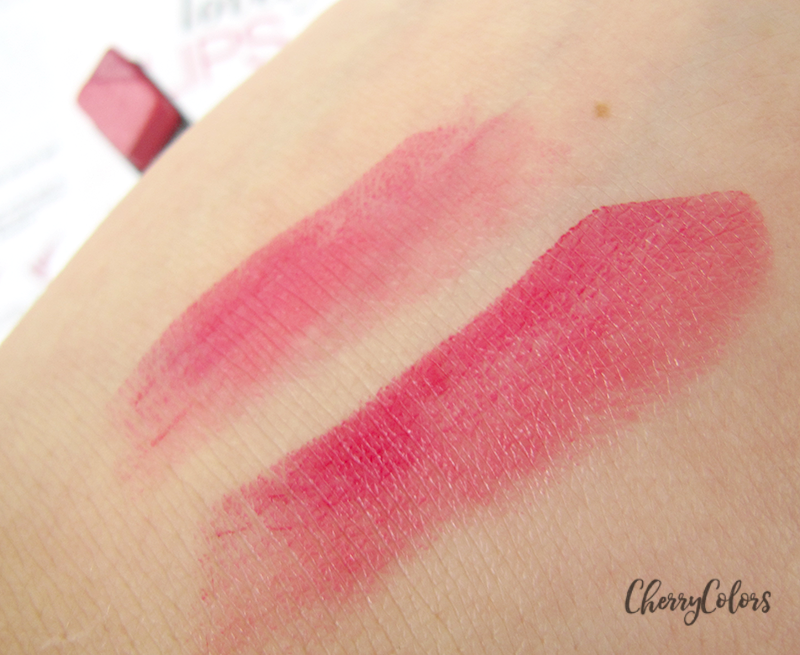 It's buttery, glides on easily and it feels like nothing on my lips. If I don't want to wear the dreaded 90's look, I can use it as a regular lipstick which makes it look even more interesting. It's a cream lipstick and it does give a natural glow (it's not matte). It is not long lasting, but since the application is quick and hassle free, I don't mind reapplying it. The shape is just perfect! The color combination is something I really liked on my lips. The packaging is sleek and chic. It closes nicely, but it does feel a bit flimsy as the cap jiggles a bit, there's some air left in between the cap and the lipstick, but it's not really bothersome as it closes nicely. Overall I'm slightly impressed by the two products. None of them was bad, one actually got me totally unprepared. This is why I can't wait to try some other products from their new line. The lipstick will surely be my new to-go lipstick. And with a lipstick collection as big as mine, that's a thing that says a lot. Which products got your attention from the upcoming seasonal change of line?